In many ways, Idle Theory is an elaboration upon one single, simple idea: the idea that living creatures spend part of their time busy acquiring energy to sustain their metabolism, and spend the rest of the time idle, and that furthermore they generally try to be more idle rather than more busy. And yet this expression of the fundamental idea underlying Idle Theory is itself one that has grown from the process of extending and elaborating Idle Theory. At the outset, Idle Theory was a notion I had about myself. A few years later it became an idea about human nature, and in particular economic behaviour. It was only much later that I extended it to include all life. The process of extending and elaborating Idle Theory was really simply a matter of discovering the most general implications inherent in looking at life in this way, of sketching out a 'big picture'. For once I had begun to think of human economic systems as being primarily concerned with maintaining and increasing human idleness through innovation and trade, I began also to begin to think that human ethical codes were concerned with exactly the same matter, and that what was generally universally regarded as 'right' was what served to increase human idleness, make life easier, and what was universally regarded as 'wrong' was what served to decrease idleness, and make life harder. And, furthermore, since Idle Theory seemed to be concerned with the long term goals of humanity, and it had only one good, and its universe was bounded by a maximum of perfect idleness, and a minimum of total busyness, it dimly reflected a kind of one-good monotheism, with a heaven and a hell. And yet it was not out of a comfortable abstract interest that I set out to explore the implications of Idle Theory, but rather from discomfort, perplexity, and doubt. And this was because I already had a Big Picture. It was the Big Picture which was the conventional wisdom of the age. And it was a conventional wisdom in which Idle Theory was out of place, like a blot on a landscape. 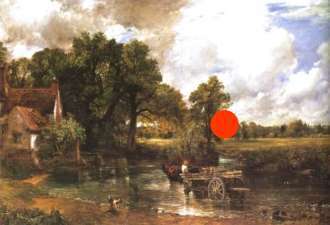 Indeed, perhaps even a discordant red circle on Constable's Haywain, asking to be removed. It didn't belong. The Big Picture here represents our most general understanding of life, the universe, and everything. The Big Picture tells us who we are, where we are going, and what's happening around us. A big picture is a map of everything, in which everything has its place and its explanation. And in my own pre-existing big picture, the conventional wisdom, the purpose of human economies was to increase human wealth, where 'wealth' largely consisted in some number of possessions - houses, cars, swimming pools, etc. Economic growth consisted in producing a bigger and bigger cake of wealth. On this, everyone was agreed. There was only disagreement about how the cake should be shared out. And the purpose of the economy was most definitely not one of increasing anyone's idleness, or freeing people from work. On the contrary, the economy was all about setting people to work hard creating wealth, and so become rich. And because Idle Theory's vision of economic life completely contradicted prevailing opinion, it was in conflict with it. And while Idle Theory remained a purely economic idea, and a highly restricted one at that, it could not contend with conventional wisdom. It was only by painting another big picture, to rival the received traditional big picture, that Idle Theory could withstand conventional wisdom. But it took a long time to assemble what seemed to be the big picture inherent in Idle Theory. But the net result was that I had two Big Pictures. One was the elaborate and detailed conventional wisdom, and the other was the broad sketch outlines of Idle Theory. How was I to know which was the better picture, the truer representation of the world? In many ways, big pictures are, like jigsaw puzzles, made up of many little pictures. But in the case of jigsaw puzzles, the big picture is on the front of the box of little pictures, so we know what big picture we are trying to reproduce using the little pictures. But in the case of mental pictures - or theories -, we don't have that big picture on the front of the box, but instead only a whole collection of little pictures which we try to piece together to form a big picture. And we tend, using these little pictures - which are the everyday facts of life - to put together different big pictures. And indeed, if Constable's Haywain might be considered as a large collection of different coloured dabs of paint, these separate dabs might be assembled to produce entirely new pictures, most of them 'abstract' in character, but others depicting the Birth of Venus, or a portrait of Dante, or the launch of a space shuttle. But if we were to chop up Constable's Haywain into several dozen small square pictures, and randomly re-assemble them to create new pictures, we are unlikely to reproduce the Haywain, although from time to time the Haywain would reappear. More frequently, perhaps, parts of the Haywain would reappear - a tree, a house, a horse - displaced from their correct location. But for the most part we would be presented with a chaotic patchwork. But, not only would it appear chaotic, but also it would be possible to discern the individual squares - we would see the joins between adjacent squares as a set of vertical and horizontal lines. We can see the joins because they are where the colours and textures of adjacent squares don't match. Only when the squares were put together to form the Haywain would all these joins vanish. And this provides a clue as to how we might know when, assembling all the bits of our pictures of knowledge together to form a big picture, we have the right idea: we can't see the joins. All the little pictures merge seemlessly together to form one single big picture, and all the little pictures vanish into the big picture, and you can't see the joins. And what applies to pictures like the Haywain applies to the Big Picture we carry around. If you look closely at the conventional wisdom, you can see the joins. If what is taught in universities is any indicator of conventional wisdom, one can see the joins in the structure of universities, that they are divided into faculties and departments, and you can see the joins between them. They teach different things using different terminologies in different buildings. It isn't joined up. It's all fragmented. The "universal" claims of universities are aspirational rather than actual. In a truly universal university, the faculties and departments would all merge seamlessly together, and you wouldn't see the joins. It's this way because all knowledge starts off with little pictures, and in most cases tiny little pictures. The study of, say, Botany probably began with farmers who were interested not only in the plants they tried to grow to eat - like wheat and barley - but also the weeds and brambles they tried not to grow. And so a little knowledge about a few plants expanded to become the study of many plants, and finally all plants. And the little department of Botany merged with the department of Pond Life and the department of Beautiful Flowers. And this in turn merged with the department of Animals to form the department of Biology. And this process of growing and merging is probably a bit like how John Constable painted the Haywain, doing a bit here and a bit there, and gradually merging the different parts together to create the finished big picture. But although the Haywain is a big picture, it is itself a component of a bigger picture. How do we know? Because, at the sides and top and bottom of the Haywain, we can see the join with the wall of the gallery where it hangs. Somewhere beyond the edges of the Haywain is the Greater Haywain, which may include a church and a flock of geese. We will never know. Constable stopped at the edges. Idle Theory tries to join things up. In Idle Theory ethics, politics, economics, law, evolution, life sciences, physics, and mathematics are all joined up. Or at least joined up a bit. They're probably not joined up right. And they're not joined up in any great detail. Idle Theory is a sketch outline Haywain, painted with a broad brush. And I painted Idle Theory the way I once used to paint pictures, which was to take a blank sheet of paper and make a few faint marks on it with a brush or a pencil, and then stare at it until I thought I saw something in it somewhere - a face, an arm, a tree -, and from then on I would try to discover the rest of the picture. If I'd found an arm, I'd go looking for its hands and its shoulder, and then the head and torso and legs. The paintings had an inner structure which was provided by the first faint marks upon it. My task as an artist was to gradually reveal the hidden big picture. I didn't know what the picture would end up looking like. I didn't have the big picture on the front of the jigsaw puzzle box. I just had the pieces. I used to gradually build up a picture. But as the picture got bigger and bigger, it became harder and harder to expand, in the same way that the radius of a steadily linearly expanding spiral lengthens ever more slowly. So I never used to finish them. I have the same problem with Idle Theory: I'll never complete Idle Theory either.